"'Do you believe in God?' is a fatuous question"
Though some Quakers are non-theists, many speak about ‘the Spirit’, ‘the Light’, ‘the divine’, ‘the Truth’, or even ‘the Christ within’. The emphasis is on experience rather than belief – and on deeds, not words – and there is certainly no creed, no doctrine or dogma. Geoffrey Durham, once better known as ‘the great Soprendo’ and watched on TV by millions, told us in Wychwood Library that he was here to talk about his experience of … ‘God’ (as good a shorthand as any, he said) and how he came to adopt Quakerism as a result of getting stuck in a traffic jam in front of the same poster day after day. After a period of attending Quaker meetings (which any of us can do, by the way) and experiencing that hour of broken silence, he eventually became a member of what is also called the Religious Society of Friends. He said that it was something he had been looking for, that it gave him meaning and purpose. And he didn’t want to convert us (‘Quakers don’t evangelise’) but he did want to tell us what Quakers are and ‘leave the rest to you’. Born actor and raconteur that he is, Geoffrey Durham could entertain an audience for hours. His tale of the original Quaker, George Fox, was graphic enough for us to be able to picture the event readily. Back in 1652, Fox interrupted a church sermon by standing on a pew and, now at eye-level with the preacher in his pulpit, saying loudly: “You will say Christ saith this and the apostles say this: but what canst thou say?” Fox wanted to know what the preacher could say from his own experience, “inwardly from God”. From there was born the Quaker belief that there should be no such thing as clergy and laity (“we abolished the laity!”) and that everyone and anyone is equal. George Fox wanted every Quaker to ‘answer that of God in every one’. So all can listen to the Spirit, all can have equally valid spiritual experiences (both at formal Quaker ‘meetings for worship’, and elsewhere) and all are also deserving of equal respect – which includes the social and political, indeed the geo-political, sphere. It is then no surprise that Quakers are active politically, pursuing such concepts as the “Good Society”, and, famously, being wheeled on to BBC Radio 4’s Thought for the Day – ‘whenever there’s a war on!’ said Geoffrey - to talk about pacifism. When Geoffrey first picked up the little Quaker booklet Advices and Queries, it opened in the centre and he read these two words: Live Adventurously. He has obviously been doing so ever since. And in his book Being a Quaker he also quotes paragraph 28 of the same booklet: Attend to what love requires of you. It’s what he calls ‘the starting point of an adventure in the spirit which has changed millions of lives’. 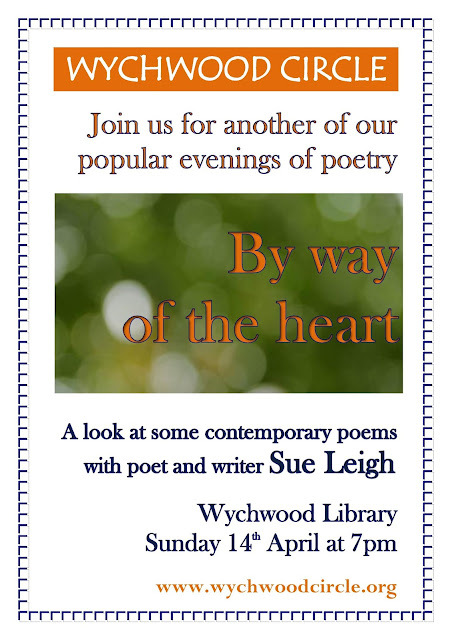 Anyone is welcome to join us at Wychwood Library at 7pm. Some reading suggestions can be found in the previous post on this page. MAY 2015 GENERAL ELECTION: WHO IS MY NEIGHBOUR?